CINCINNATI - We may have found an answer to a Westwood family's prayers. WCPO brought you the story of Harold Morgan, a terminally-ill Navy veteran hospitalized in Alabama. His family was trying to raise $6,000 to pay for a medical ambulance to drive him home so he could get hospice care at the VA Hospital here surrounded by his family. Hundreds of you shared on social media, and that's where a special connection was made that may bring him home. A woman wrote that she has a friend who owns a tour bus company and wants to help. We told Morgan's family, they got in touch with the company, and they're trying to work out the details. The family's GoFundMe page had raised more than $3,600 at last check. We'll keep you posted on what happens. 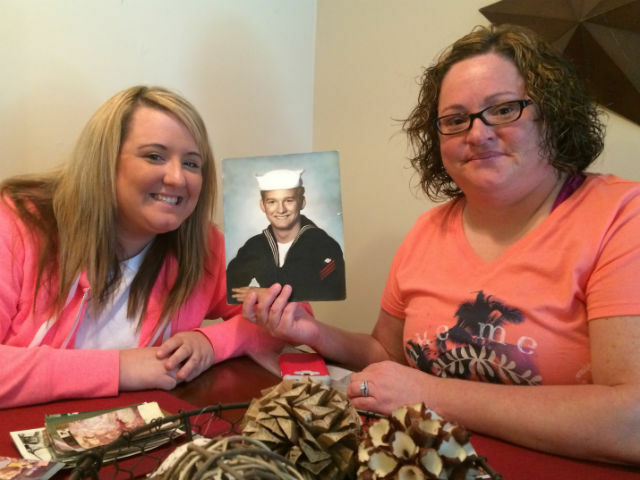 Harold Morgan's daughters, Casey Morgan and Tracy Hughes, with his photo. 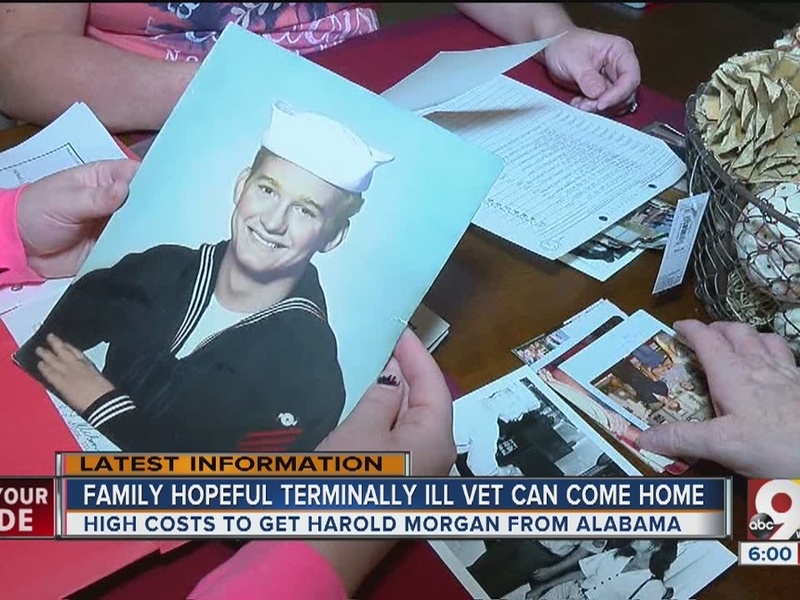 CINCINNATI - A Westwood family is trying desperately to bring their terminally ill patriarch -- a Navy veteran -- home from an Alabama hospital. But, there's one big hurdle -- insurance won't pay the thousands of dollars needed to get him back to Cincinnati. Harold Morgan's relatives have started a GoFundMe page in hopes of raising $6,000 to get him here. A hospice bed awaits at the VA Hospital. Morgan is so ill with cancer that he's paralyzed, can't speak and has to be driven north in an ambulance. It's costly, but his daughters and a cousin strongly believe that somehow it will happen. "It's frustrating for us up here knowing he's down there and there's nothing we can do," said Morgan's daughter, Tracy Hughes. 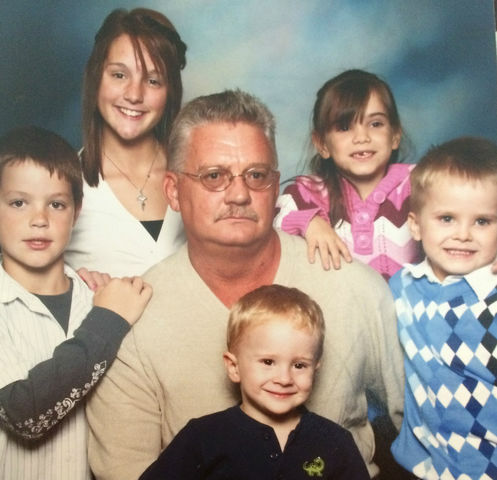 Harold Morgan and his grandkids. Morgan served 10 years in the Navy onboard the USS Forrestal aircraft carrier. After he retired from the service, he went to work for a shipbuilding firm, Astal, in Mobile, Alabama. "It has left him completely paralyzed," Hughes said. "So, transporting him is difficult because he cannot sit up. He has to lay down. At most, during his physical therapy, he can only sit up for five minutes. So, he has to be medically transported. "There are different organizations that help with flights if he's able to sit up and fly on his own without supervision. However, he is not able to." "Yellow Ribbon Foundation, Wounded Warriors, AirCare for Vets, the DAV, the VA itself ... It almost seems like every answer we get is, 'Well, we can't help you. See if they can,'" said daughter Casey Morgan. "It's just one big circle of basically no. So, it's frustrating." The Mobile Infirmary Hospital would only tell us that Morgan's condition is listed as stable. "He's fighting and that's what he's always been is a fighter," daughter Casey said. "With no family being down there, it would be best if he was up here with us so he could be surrounded by the ones that love him," daughter Tracy said. Cousin Stephanie Bevis is optimistic. "We're going to make it happen," she said. "I want to see the happiness on his face when he sees his grandkids."